Just saw this posted on lifehacker, tried it out, and had to spread the word! This freeware smartphone app will turn your wifi enabled smartphone into a wifi router (ad-hoc, aka: computer-to-computer) — in other words, you can take your windows mobile phone, and if you have a data plan and wifi, you can have any other wifi device connect to it as if it were a router! I could definitely see this as being useful when my Comcast connection goes down and my roommates and I all need to have simple access to email and such until it goes back up! Not just that, but also if you have a laptop (or any device) that doesn’t have bluetooth to utilize the bluetooth internet sharing in wm6, you can just use this as devices are more likely to have Wifi than bluetooth. It’s easy to install too — just head over to http://www.jongma.org/WMWifiRouter/, and you can either install a self install exe (which installs through active sync), or you can download the cab (copy it over to your phone or simply download from your phone directly). 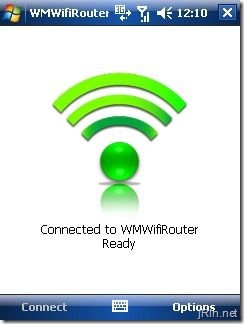 It sets up the ad-hoc network for you automatically, so all you have to do is install, tap “connect”, and then have your laptop (or other wifi device) connect to the “WMWifiRouter” network! That’s it! One thing though, as stated in their FAQ [link, 2nd post], you may have to manually set your wifi adapter on your phone to only connect to ‘computer-to-computer’ for WMWifiRouter to work correctly (and therefore, create the WMWifiRouter network) — I had to do this to get it to work because I had a bunch of wifi networks preconfigured to automatically connect on my phone. verdict? Head over to jongma.org right now and install it on your windows mobile device! Remember when we spoke about your m1330 review. I returned my m1330 and went with the m1530 – will let you know when my review goes up. Neadless to say game performance is worlds apart from the 1330 but it keeps the 1330 style – just not the screen and battery life unfortunately. yah, this has come in handy twice since I wrote the review — I love it! about the m1530, yah, I’ve been thinking about going for one of those — I’ve been going back and forth on if I should sell my desktop, and just stick w/one computer ( a laptop ), and the m1530 looks about what I’d want to go for to keep style, decent size, and good power — keep us posted when you get yours! how do i get my wm6 ics to work. i have a tmobile shadow.